Eight people from a Tanzanian medical institute have been arrested after 85 bags containing body parts were found in the port city of Dar es Salaam. 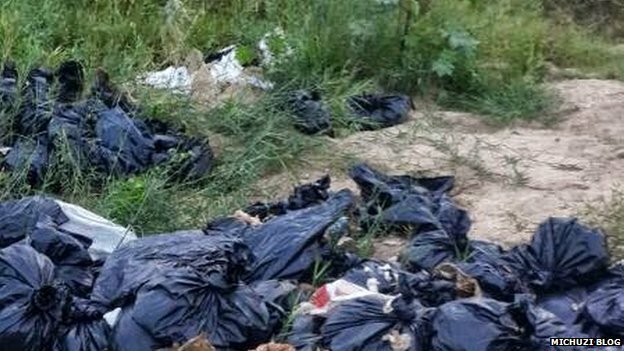 A police officer told the BBC that human limbs, fingers, ribs and skulls were in the bags, discovered in a landfill site in the Bunju suburb. Some of the bags contained surgical instruments and used disposable gloves. The BBC’s Aboubakar Famau in Dar es Salaam says the find has shocked the usually quiet city. Dar es Salaam police chief Suleiman Kova said those arrested have links to the city’s Institute of Medical and Training University (IMTU). Residents said they became suspicious after a truck repeatedly dumped black plastic bags weighing approximately 25kg (55lb) each. Posted on 22nd July 2014 by newsafrica. This entry was posted in Africa, Human Rights Violations, Race Relations, Tanzania and tagged BBC, Bunju, Chief of police, Dar, Dar es Salaam, Police officer, Salaam, Tanzania. Bookmark the permalink.